Today the 19th April 2016 dawned bright and sunny, just the day to get down to some investigating, but this time this will be just a bit different. Instead of helping families who are searching for family plots or hidden meanings in the symbolism of the memorials-carvings , a new person has stepped forward to help with the detecting . Step forward DCI Banks – yes one of his famous cases will involve Holbeck Cemetery and the Nosters!! DCI Banks is a very popular detective series broadcast on TV and today it is being filmed in Holbeck Cemetery. DCI Banks is a British crime series produced by Left Bank Pictures . The series is based on Peter Robinson’s inspector Alan Banks novels and stars Stephen Tompkinson as Detective chief Inspector Banks . In 2013 the series won in the drama category at the Royal Television Society Yorkshire Programme Awards. LEFT BANK PICTURES writes ‘The fourth series , (part of which is being filmed today), will feature the usual powerful personal stories for the lead characters,both in their private lives and in their work environment; a deeper exploration of Banks’ relationship with his parents, further complications in Annie and Banks on/off romance and a personal crisis that threatens Helen’s career.’Annie is played by Andrea Lowe and Helen is played by Caroline Catz. 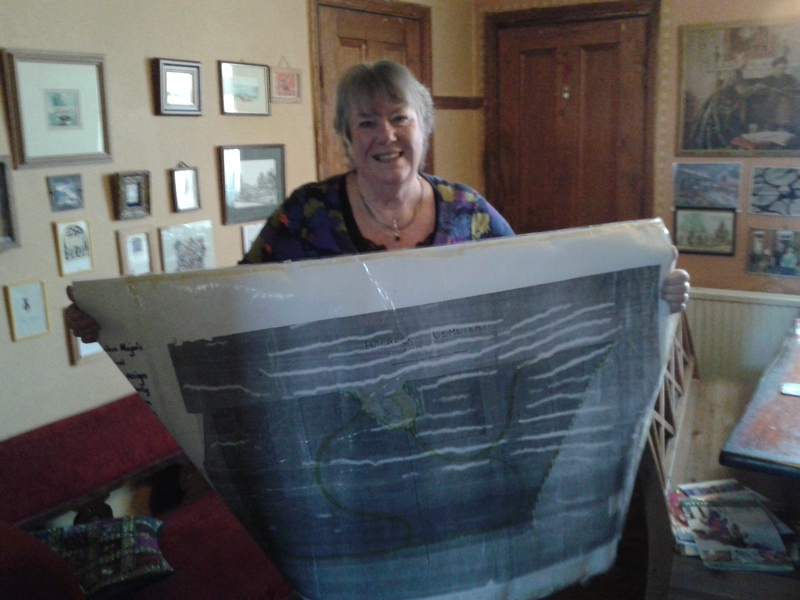 This led to Helen telling us a bit more about her ancestors history in Holbeck, with more information promised later. So here is a ‘taster’ based on Helen’s information. Joshua Horner Robinson lived at Wellington House, Mill Green Holbeck when he purchased three grave-plots, 9433, 9434, 9435, on 23rd September 1880 at the cost of £3 per plot. He needed the three plots together because he was having a grand memorial erected for his family and his wife, Maria , who had recently died on 16th June 1880. Joshua Horner Robinson was a wealthy man when he died on 1891, leaving £140,000, a huge sum of money at that time . His elder son, also named Joshua Horner, who was living in Balm Walk at the time of his father’s death in 1891, did not inherit the lump sum and was effectively disinherited . although the money was put in trust for him to have an income from,so perhaps he was feeling a bit better off and purchased a plot of his own . Joshua senior’s funeral on 8th May 1891 was very grand affair as noted in the daily paper. The late Joshua Horner Robinson. The internment of the remains of this gentleman took place on Tuesday afternoon at Holbeck Cemetery. A large assembly of relatives, friends and work people were present, and there were seventeen coaches and carriages in the funeral cortege. Mr Robinson, who resided at Mill Green nearly all his life, was a well-known man of business, though not in the ordinary sense a public man. He had entered his 75th year . He was for many years a maltster and corn-miller, and had recently become connected with the cloth mans’ business. 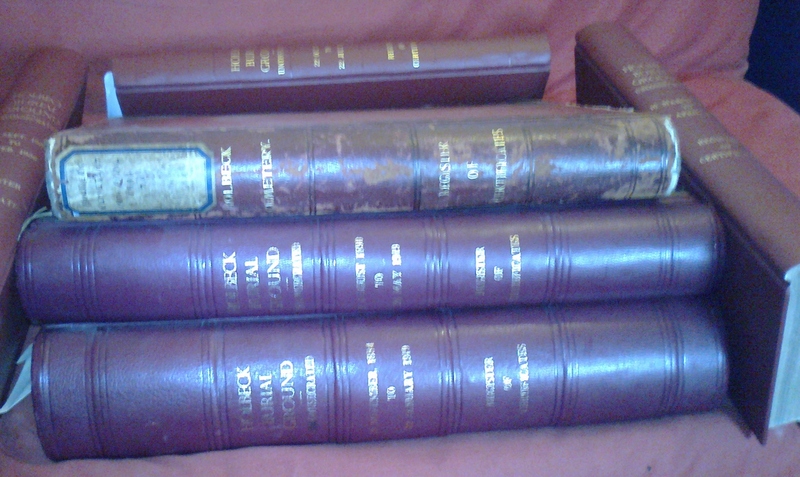 Mr Robinson is reputed to have died a rich man, and left behind him five sons and one daughter to mourn his loss. The Revd. O Cookson officiated at the graveside.Mr W Swales was the undertaker. 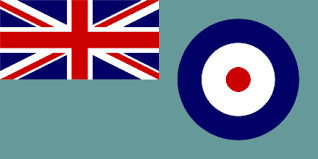 This year, as it is the 70th anniversary of The Battle of Britain, we will be focusing on some of the RAF personnel whose memorials are in the cemetery . 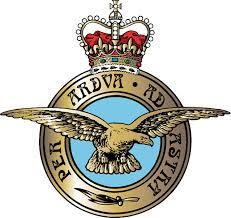 We will try to tell visitors some information about the family and/or the squadrons that each served in and in some cases the last raids in which they saw action. These young men , who were only aged between 19 years and 24 years old had already become pilots, wireless operators or gunners and flew in vital WW2 raids over Hanover, Nuremberg, Berlin , were involved in the evacuation at Dunkirk and one leading aircraftsman, Denis Palmer, was a member of RCAF , whose air transport flew supplies, troops and casualties from the Far East in 1946. Most of these young men were local to the area but one Flight Engineer left behind a wife who lived in Lavenham , Suffolk – such a long way from Holbeck. 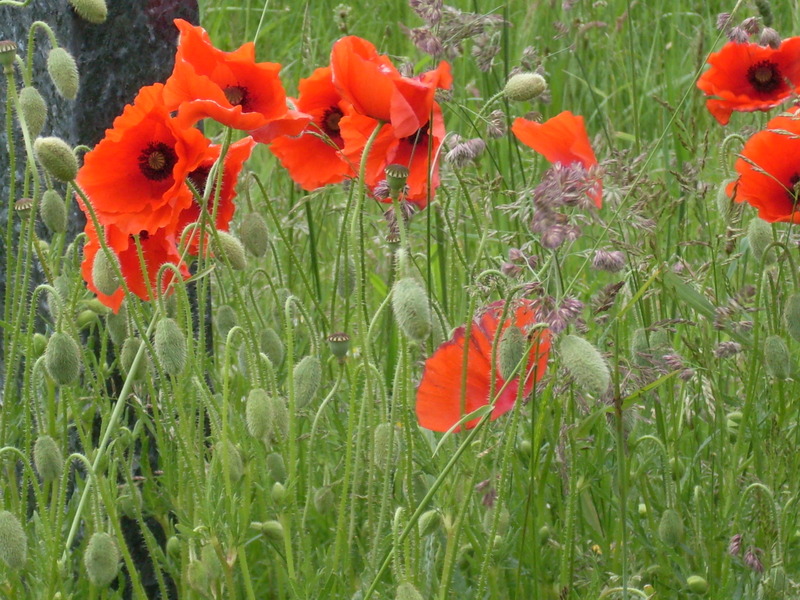 We will lay a British Legion cross on their graves and then gather at the Cross of Sacrifice, near Beeston Road, to read the names of all those servicemen and women who are remembered on memorials in Holbeck cemetery and who gave their lives for their country. Finally scattering poppy petals for all these lost lives . 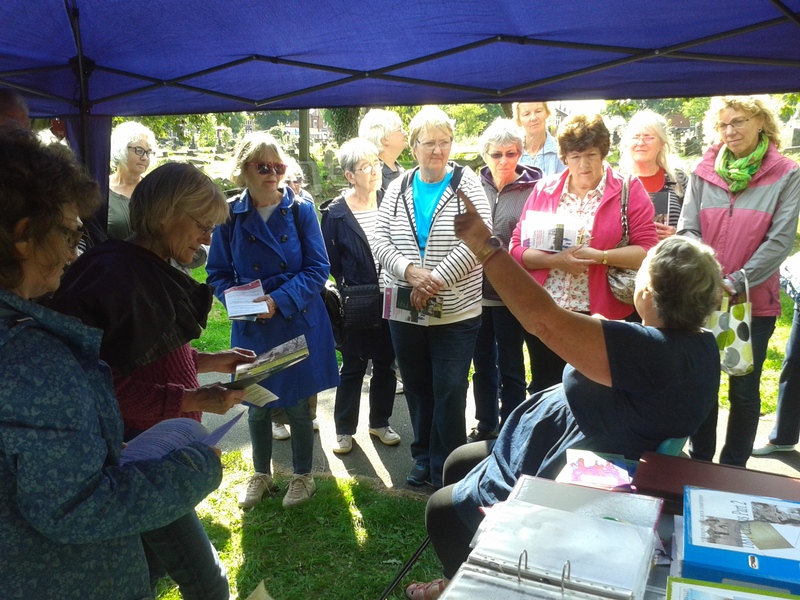 After a really exciting and very busy Heritage Open Day with about 50 people dropping in to see us and explore Holbeck Cemetery we thought that was it for this month but it was not to be. 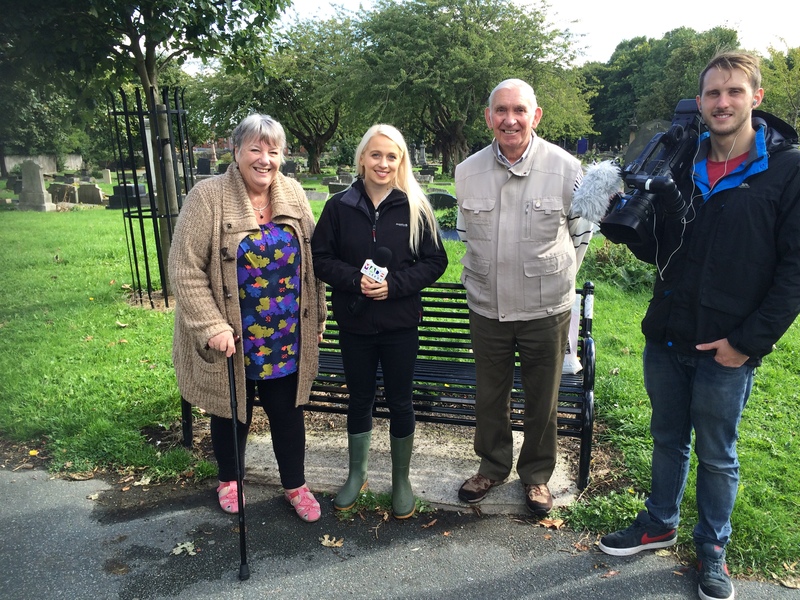 We had a phone call from Beth Krysta Wilson who works for Made in Leeds , which is a fairly new TV station, interested in local stories who wanted to talk to Ken Burton and myself about the cemetery. We had been worried that the cemetery would not look its best if it was a rainy or windy day but thankfully Tuesday was a nice sunny day. Great atmospheric clouds added to the artistic views as we sat chatting about how The Friends of Holbeck Cemetery had started and talked about some of the events we conducted and a little history about some of the interesting and important monuments. It is always interesting to hear about how people get to know about the cemetery and the cameraman explained that he had filmed there before for the opening credits of the new TV station. I had to confess that I had never seen these on the TV even though I do watch the channel. Beth was very easy to talk to and was genuinely interested in the stories we had to share. 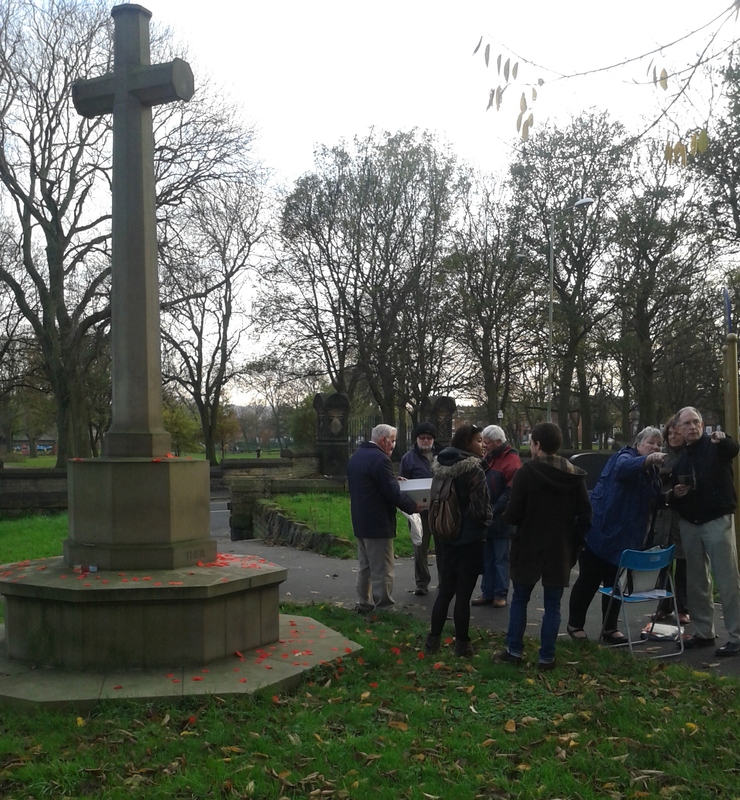 Ken then took them to see the oldest memorial in the cemetery, which is always a puzzle to visitors as it is older than Holbeck Cemetery, being brought from St Pauls in Park Square when that church was demolished. After taking some photos for FOHC’s archives they left to do some more filming around the cemetery. When we started as a Friends group in 2001 we never realised what interesting people we would meet, on our walks, talks, tours, conferences. Heritage Open Days and with the media. It makes all the hard work worthwhile to see people interested in this once forgotten and abandoned site in South Leeds. 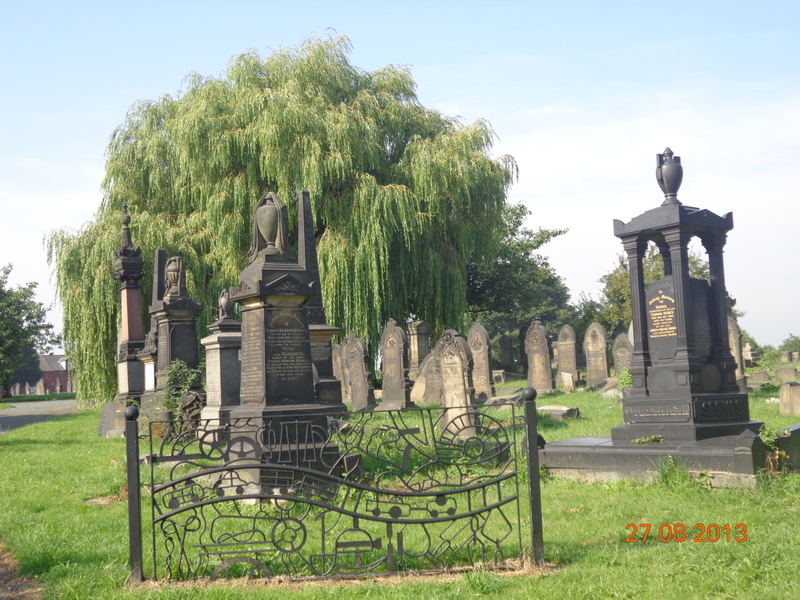 Do come and check out this interesting cemetery for yourselves. Our next walk will be our Remembrance Walk on SUNDAY 15th November at 2pm and everyone is welcome, more details later. Hoping the programme will be part of Made in Leeds TV- The Book It List aired on Wednesday 23rd at 6:30 and 9:30. You will also be able to access it on their website. Come and join us on Friday 11th September at 2pm when we will be having an exhibition of some of our archive material . Come and view the original plans , designed by Joshua Major in 1857. Look through the original receipts books, telling you the date, the purchaser and their address and how much the plot cost. Look at the flora and fauna that is here. DO COME AND JOIN US FOR THIS SPECIAL EVENT – its FREE !! On Sunday 12th July 2015 three members of Friends of Holbeck Cemetery had the pleasure of welcoming and showing round the cemetery four members of the Longley family, two who had travelled from Southampton and two from Leyburn. They were here to zee the family grave and take details of the family members interred there. It was a lovely sunny aft4rnoon and most enjoyable. Joseph Longley started the bedding manufacturing business in 1835 and his shop fronted onto Lands Lane, Leeds, prior to the redevelopment of the area in 1902.The company showroom was numbered 51and 52 Lands Lane. In 1903 Longley’s bought a new site and by 1905 had moved in to the newly constructed building on the corner of Albion Place and Lands Lane, this was to become 6 Lands Lane under the new numbering that took place after the re-development. The building was occupied by the Longleys until their demise in 1965. This building was used in 2005 by All Sports but is now occupied by Pret A Manger. 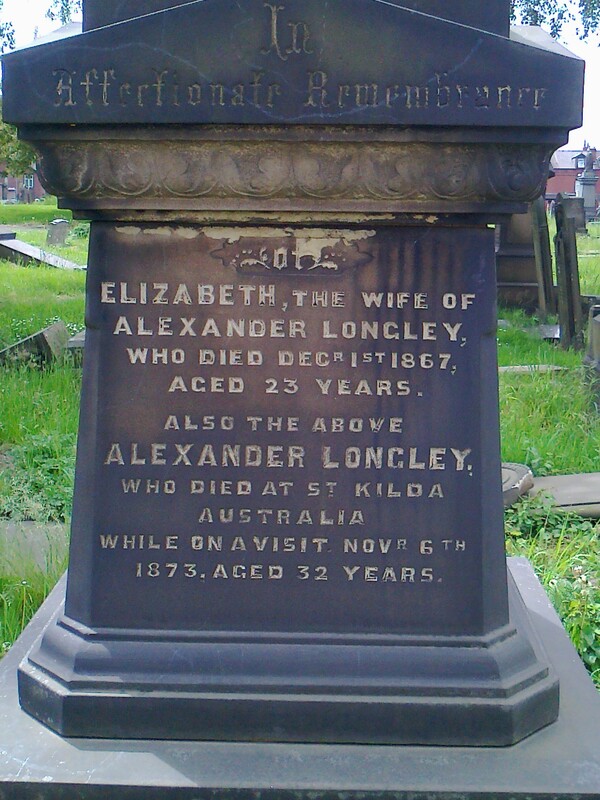 However the Longley name can still be clearly seen on the top balustrade. The company also had manufacturing premises at the corner of Harper Street and New York Street, these being 22-38 New York Street, after their demise it became a bank and today still stands as an amusement centre. They also had premises in Borough Mills at 21 Great Wilson Street where they manufactured bed-springs and wires for their beds and mattresses. The company was run by the family until it was voluntarily wound up in July 1965, the chairman at this time was John Chapman Longley. He had a long retirement after the business ended , and did not die until August 19th 1981. The family still own both of the premises which are held in Trust. Walter Longley who was born in 1845 at Fishers Yard, Meadow Lane married Emma Dearden in 1871 and they produced 11 children. Private Ernest Longley 15/601 Leeds Pals was one of their children . 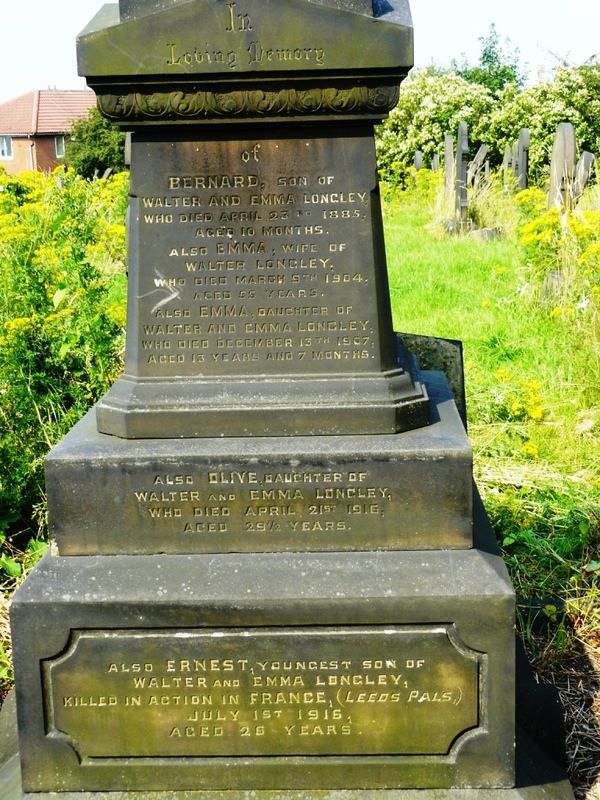 ‘Ernest Longley was the youngest son of Walter Longley, Park View, Newton Road , Leeds. after his education at Leeds Grammar School, he joined the family business of Joseph Longley, Bedding Manufacturers of Lands Lane and new York Street. He was a gifted young footballer who played for Leeds Grammar School, the YMCA and also Leeds Yarnbury. On the outbreak of war he enlisted into The Leeds Pals on 4th September 1914 and was posted to section 10,3 Platoon of ‘A’ Company to become Platoon bomber under the command of Captain Richard Morris Stanley Blease.